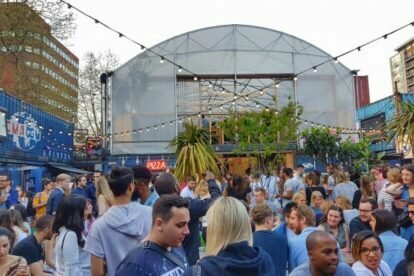 Located in South-west London’s now-trendy Brixton, Pop Brixton is a quirky centre of scrummy street food stalls, stylish restaurants and alcohol-specialised bars. During Fridays and Saturdays, DJs and musicians even take to the stage, making Pop Brixton the perfect pit stop for a big night out. Although open-air during the summer, in the colder months luckily the hub is roofed, making it a cosy spot for a bite to eat or to enjoy a couple of bevvies with friends. Whatever you fancy, Pop Brixton is sure to sell it, from award-winning Italian pizza from Made of Dough to your favourite bottle of red at The New Zealand Cellar. After your meal, why not browse the range of quirky shops selling everything from second hand jeans to jazzy sunglasses? This winter, there is a whole host of activity happening at Pop Brixton, from vintage kilo sales, to garage sales, to jazz club nights.